I'm glad so many of you enjoyed the orange sewing machine, and shared your memories of older machines. I wonder why sewing machines haven't been given the retro makeover like other home appliances have undergone? You can buy a toaster, kettle or mixer in an array of colours and styles but when it comes to modern sewing machines it's white, white, white and maybe a cream! Paola is spot on - the modern world has become very colourless. I'm very guilty of this too - our new car: silver, our kitchen: white, our bathroom: sandy beige, our lounge: beige: our large floor rug: mostly white and grey, even my dog is black and white (ha ha ha, just threw that one in to see if you're reading closely!). Craftastrophies and Cha-Cha both asked in the comments to the last post about my Babylock and my thoughts about it. I have a Babylock Enlighten model and every single day I think how glad I am that I ponied up the rather substantial amount of money to buy it. I bought it for myself for mother's day back in 2011, the best mother's day present I've ever received! I didn't really have any problems with my old overlocker, a basic Toyota model and in fact I used it for nearly 10 years before servicing it for the first time! It was just that I had to spend at least 45 minutes or more adjusting the tension each time I changed threads and never really getting it quite right. Not having to adjust the tension each time I change threads because the Babylock has automatic tension adjustment itself is worth every cent because it saves me time and stress. And with the air jets threading the machine at the press of a button it's super quick to change threads too. Another feature I really like is that to do a rolled hem edge all I need to do is switch a lever and take out one needle. On my old overlocker I had to unscrew the plate, put another plate on, and then take out the needle, which was fiddly and time consuming. I use the rolled hem feature on fine fabrics that I don't want to do a narrow hem or on knit clothes for Anna that I want to get the lettuce hem effect. I also like being able to disengage the knives with the twist of one knob instead of having to loosen the screw to drop the knives and then having to put the knives in the right spot again and tighten the screw really tightly when I'm done. I've been using the overlocker with the knives disengaged to sew elastic onto waistbands so it's really useful to be able to do this quickly and easy. Time and less stress is everything these days! Apart from these things, I must admit to using the Babylock really just for conventional serging of raw edges and sewing kints together and haven't really used any of the other fancy stitches and features of the machine such as flatlocking or wave stitching. I've been using it constantly for the last two years without a single problem so it's been very reliable too. It goes over thick fabrics and thin without hesitation, and the bright LED lights are really good too. So I can thoroughly recommend a Babylock if you're in the market for a new overlocker. 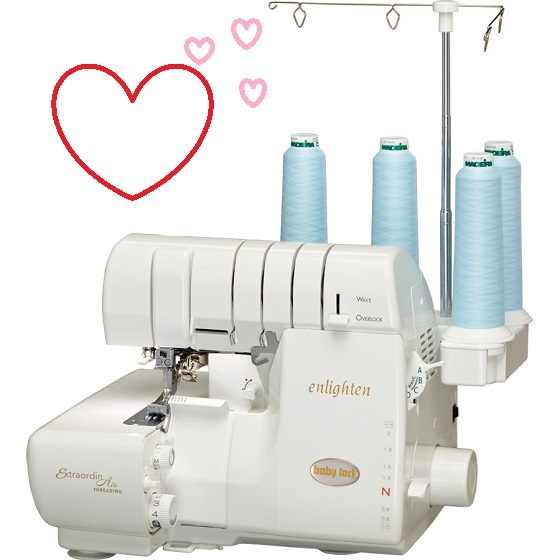 But if you're a whiz at threading and adjusting the tension on overlockers and you don't use those other features too often then you'd probably be right with a less expensive model/brand of overlocker and use the extra $$ on fabric! But I do hope I've helped some of you make a decision, it is a fantastic machine and I'm just paying the favour forward - it was Carolyn over at Diary of a Sewing Fanatic that inspired me to get one! Saw a black retro look Singer in spotlight the other day... but all plastic! Somehow don't think it'll last the distance it's predecessor did! Things these days just aren't built to last the distance are they? Free is very good - less money spent on your overlocker means more to spend on fabric! I had the priveledge to see the baby lock machine and its capabilities lasy year when I visited a dear friend. What an awesome machine and its worth the money for the reasons you mentioned. I have aa old singer serger that I bought 27 years ago and I service it for the first time five yeara ago. I bought an updated version from Walmart, its ok, just a backup serger. My next purchase will be a BabyLock as soon as the sewing gods send me the money. LOL! Hope the sewing gods send us all a bit of money! Yes, this is my dream machine. I'm making do with a Bernette 334 from a few years (1980) -- that works perfectly -- except I never change threads (what a pain that is) -- and I never use a rolled hem (I'd love to but what a pain) -- it's all steel. But that aside -- I love the enlighten and just have never spent the money. It's funny how those small things like changing threads can be so annoying! I've seen a live demo of that machine and it is AMAZING. Like magic! I didn't know the tubes needed to be cleaned out! Oiy that means I'm going to have to send mine to the dealer too since it's been over 2.5 years for mine...though I'm having no issues with it...except for the lightbulb being out and that's totally my fault. I love my Imagine serger absolutely positively love it! And I don't use mine as much as you do or as many functions as you...couldn't imagine going back to the older versions of serger AT ALL! I highly recommend purchasing on of the upscale Babylock sergers, you won't be disappointed! Hmmm... I'm nearly convinced! I have an old 4 thread Singer one (not even differential feed) but it works well and only once has been serviced. I don't use mine as much as you, but it's great to have it. When I get a job that might have to be a celebration gift. I love the little hearts you have around the photo! If your Singer works well and you don't use it much then there's probably better things to spend your $$ on - like more fabric! This is a very timely post, I use a Singer O/L that doesn't even have differential feed but so far I haven't been too distraught about that. My next garment could be the test, chiffon that I plan to do a rolled hem and like your old machine, plate change etc etc. I also have a babylock over locker (the Evolve) and I love it for all the reasons you do. When I was researching the market for a new one 5 years ago, I was sold on the jet air threading, automatic tension, the hassle free conversion to cover stitch. Worth every cent. It's pretty easy to be sold on those things - just like my new car that reverse parks itself, who wouldn't want that? Thanks for doing that review for me! Think I will have to start saving! I have a blue sewing machine from the 70s that is sitting in the shed. I bought it second hand and when it broke, it would have cost more to fix it than to buy a new machine. But I can't let it go! It's BLUE! The thought of not having to fiddle is definitely nice! I don't find my overlocker too hard to thread, and I can do a rolled hem by just taking out one needle but I do have to manually disengage the blades. And I can just never ever get the thread tension right. I sew knits more on my regular sewing machine, because I'm more likely to get the tension right! Being able to cover stitch would be really nice, too. Not being able to get the tension right is why I rarely sewed knits in the past. Sounds like you have a mini sewing machine museum in the making! Hi Kristy, I am not sure if I ever told you thank you! You inspired me to finally get my own Babylock Enlighten back in Nov 2011 and it was the best decision I ever made. I had an old Singer Serger from the 1990's, it worked but it was so touchy and the tension so fiddly I hated using it, so I never used it The Enlighten is a joy and I use it every chance I can. Just the other day I fixed the elastic on my matress pad, took all of 10 minutes. that included taking it off the bed, walking to the other end of the house, setting up the enlighten with a different colored thread and serging the elastic on. Thank you, Thank you, Thank you... something that use to take me half a day and a lot of frustration now takes minutes. I'm so glad you're happy with the Enlighten - there's too many other things frustrating with sewing to be worried with thread changes and tension!